While I'm on the topic of weddings another celebrity ceremony took place last week which I'm also so excited about! 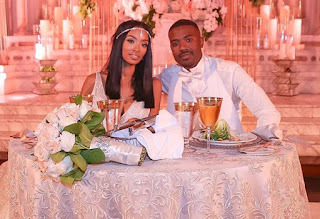 Ray J and Princess Love of VH1’s Love & Hip Hop: Hollywood, (which returns soon) celebrated their vows in a fairy-tale wedding ceremony on Friday night at Vibiana in Los Angeles. I just want her to have the time of her life and remember it as the best day in the world. Even when I wasn’t with her, I told my friends ‘She the one, she the one.’ It was just something about how I felt when she was around me,' Ray J gushed. Princess also said, He’s the only person I’ve ever been with that I couldn’t see myself without!' Awww I love them. Princess Love wore a Lazaro ball gown and her husband looked dapper in a black tux with a white shirt and white bow tie. In the way of guests, rapper The Game was one of Ray J’s nine groomsmen and sister Brandy was a bridesmaid, and she sung 'At Last' for the couple’s first dance and Anthony Hamilton also sang a beautiful rendition of his hit song, 'The Point of It All' during the intimate ceremony. 150 guests attended including Ray J’s Love & Hip Hop co-star Safaree Samuels. The ceremony will be featured on the new season of Love & Hip Hop: Hollywood.